Find out how BigCommerce’s website builder stacks up against the e-commerce competition. Just as the name implies, BigCommerce is all about doing it big: it has big menus with big features so you can sell thousands of products and make hundreds of thousands of dollars, all while keeping tight control over that process. If that sounds ideal, then BigCommerce might provide the perfect way to quickly set up a professional e-commerce website. With it, you can sell all the kayaks, all the clothes, all the toys, all the—well, you get the idea. But if you need something more versatile, or if you need something more in the budget range for your boutique retail site, then BigCommerce might not be the e-commerce platform for you (in that case, you might want to look at Shopify or a hybrid builder like Wix). If you’d like to skip down to the walk-through of our BigCommerce build, no sweat. You can go right to it. Many website builders have e-commerce capabilities, but few of them allow for e-commerce on the same scale as BigCommerce. Other builders limit the number of products you can sell, or they have such limited e-commerce features that you won’t find it convenient to sell many products. BigCommerce, on the other hand, lets you sell unlimited products, and it gives you the tools to do so with ease. As a seller, you’ll love the level of control you’ll have over your products and store, the powerful e-commerce integrations, and the easy-to-navigate menus that make it a breeze to use those features. Your customers will love how attractive your site looks and how trustworthy your store feels. Outside of e-commerce, though, BigCommerce feels lacking. It lacks simple design features or powerful blogging capabilities. If you need a website for more than e-commerce, consider a more versatile builder. But if you want to sell a lot of products to a lot of people, BigCommerce makes it easy to do just that. After we built our website, we used our notes and experiences to rank BigCommerce on usability, design, and customization. Here’s how it scored. BigCommerce got an average score for usability. For this ranking, we looked at how long it took to create the website and how intuitive the website builder felt. It took us one hour and 34 minutes to create our website. As a reminder, that website consisted of a home page, about page, contact page, store with five items, and a blog with three posts. Clocking in at over an hour and a half, BigCommerce took longer to create than most of the other site builders we used. That being said, building the store portion of our site felt super easy. Thanks to the “save and add another” product button, we added all our products in a matter of minutes. And since our site automatically updated with the categories we chose, we didn’t have to waste time messing around with our navigation. And as a whole, BigCommerce menus feel intelligent and intuitive. We knew that any non-retail work would be done under the “Storefront” menu, for example, so we could always easily navigate to anything we needed, even if we didn’t know exactly where to find it. But beyond navigation, things got a little dicey. We spent a fair amount of time on Google trying to figure out what felt like basic features—like how to customize the images in our homepage carousel. That, plus trying to make anything look good in the what-you-see-is-what-you-get (WYSIWYG) editor, slowed down our build time and left us feeling frustrated. Remember, though, that your theme will affect usability. If you pay for a $200 theme, many design elements will come baked in, so you won’t have to spend so much time trying to create pages yourself. But if you use a free theme, expect to hit a few roadblocks. For our design score, we evaluated how professional, attractive, and clean our finished website looked. Once more, we gave BigCommerce an average score. On the positive side, BigCommerce creates a beautiful shopping experience, just like you’d expect from an e-commerce site builder. If we’d just been creating a store and adding products, we would have given BigCommerce a five out of five for design. The store looks clean and just as professional as any big retailer website. Unfortunately, we didn’t stop there. Our blog didn’t look nearly as good as our store pages. It had a clean appearance, but it didn’t have the same professional feel that our store did. Even worse, we struggled to make our contact and about pages look anything like what we’d envisioned. After we built our full site (again, a 90-minute process), we even went back and spent another hour or two tinkering with the builder trying to improve the design of those custom pages. It didn’t work. 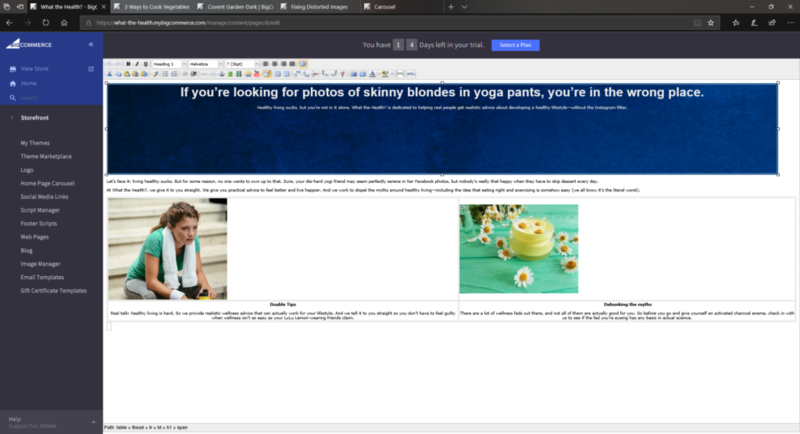 Despite our best efforts, we had to completely change our planned design to get a good result from the WYSIWYG editor. No other website builder we tested forced us to do that. So once more, we love BigCommerce for online retail. For anything else, though? Other builders work better. But again, remember that your site design can change dramatically depending on the template you choose. With a paid template, BigCommerce could score a four or even five out of five. Our customization score is based on the number of available themes, plug-ins, and customization options available. Once more, this score comes from our experience with a free theme. BigCommerce has plenty of themes—good-looking ones too—but the vast majority cost money. A lot of money. 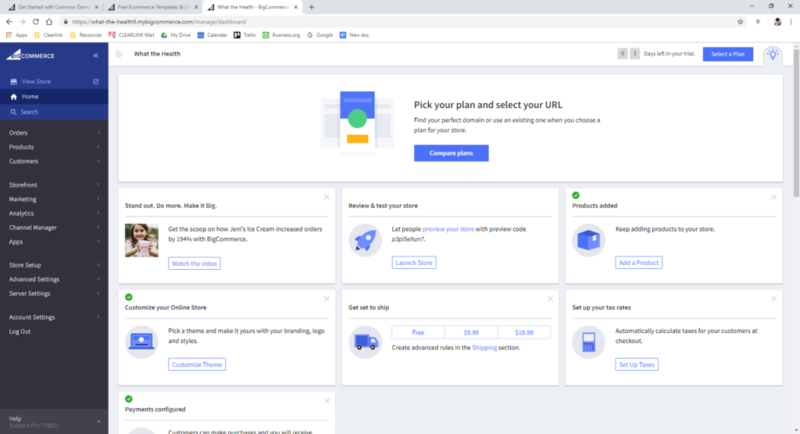 We’ll discuss the actual cost in more detail in a moment, but when most website builders offer lots of free themes and some paid ones, BigCommerce’s limited free theme selection felt a little sparse. Plus, the customization options we had with our free theme felt complicated and unwieldy. Like with colors. With BigCommerce, we could change the colors of pretty much any type of text (paragraphs, headers, links, etc. ), as well as how some of that text (links, buttons) looks when you hover over it. Unfortunately, our theme didn’t allow us to simply choose a certain palette that would update everything. Instead, we had to update every single option individually—an overwhelming task. Again, a paid theme can make this easier: they might come in colors you want, and they often have pre-built pages that you can customize. But that will increase your cost. Likewise, you get a plug-in that gives you a drag-and-drop editor—but that adds another monthly fee to your cost. Speaking of plug-ins, BigCommerce does offer over 200 of them through its app store, though it calls them “apps.” You’ll find standards like MailChimp, QuickBooks, and Facebook Ads, in addition to lots of niche apps for things like design and B2B (business-to-business) sales. Some of these apps are free, but many cost money. In the words of Billy Mays, “But wait! There’s more!” BigCommerce has plenty more features you should know about. You’ll find a list below—and you can see how BigCommerce looks when compared to Shopify. But what will you pay for all those features? Good question. Let’s talk cost. BigCommerce has some of the more complicated pricing we’ve seen among website builders. That’s because you need to account for your plan, your theme, and your apps in the overall cost. While you certainly can get a plan without spending anything on themes or apps, you’ll need themes and apps to unlock BigCommerce’s full potential. But let’s start by talking about plans. BigCommerce offers three plans: Standard, Plus, and Pro. And unlike many site builders, the price difference between BigCommerce’s plans is pretty significant: Standard starts at $29.95 while Pro starts at $224.95. BigCommerce also has an Enterprise plan for larger operations—those with over $400,000 in annual sales—but you’ll have to talk with BigCommerce to get a price quote on that. We know those are some big numbers, but you can get a 10% discount on the Plus and Pro plans when you opt for annual billing rather than month-to-month. And if you want to try before you buy, BigCommerce does offer a 15-day free trial. But before we get into what justifies that price difference, let’s talk about the features that come with every plan. And each plan comes with unlimited product listings, unlimited file storage, unlimited bandwidth, and unlimited staff accounts. So what’s the difference? It mostly comes down to how much you can sell. With Standard, you can sell up to $50,000 in 12 months. With Plus, that number triples to $150,000. With Pro, you get up to $400,000 (but after that, you’ll need Enterprise). If you sell more than anticipated and go over your plan’s limit, BigCommerce will upgrade your plan automatically. There are a few other feature differences, which you can see in the table below. Are these features enough to justify getting a pricier plan, even if you don’t intend to sell $200,000 worth of stuff in a year? Ultimately, that’s up to you, but let’s talk about why some of these features might come in handy. You can use customer segmentation to create loyalty programs, offer tax exemptions or wholesale discounts, or even just limit access to certain exclusive products. Product filtering can improve your customer’s shopping experience, giving them the ability to filter by sizes, colors, or other traits. So if you have 108 different shirts, your customers can filter to find a white t-shirt in a small size. Note that product filtering is different than product sorting (by price, popularity, etc. ), which all plans have. Having stored credit cards provides another small improvement for your customers. It allows users to save their credit card information, which means repeat customers won’t have to re-enter their payment details each time they buy. The abandoned cart saver, on the other hand, can increase your conversion rates by sending an email to customers who begin the checkout process but never finish it. The email can spur these customers to finish, giving you another sale. But remember, your BigCommerce plan isn’t the only thing that will affect your website (or your total cost)—your theme and apps can also make a big difference. As we’ve said several times, a paid theme can make or break your BigCommerce experience. But we’ve also said that BigCommerce is meant for serious e-commerce businesses—and the cost of themes reflects that purpose. Now, that is a one-time cost (unless you decide to change themes). So if you had a basic plan plus a paid theme, you’d be looking at around $30 a month for your plan and an up-front theme cost of around $200. Plus, of course, any apps you want. While BigCommerce has many free apps, many of its most popular apps have a monthly fee. ShipperHQ, for instance, starts at $50 per month. So if you’re using the cheapest BigCommerce plan, just one paid app could double your monthly fee. Plus, BigCommerce doesn’t provide a free domain with its plan. You can buy a domain name through BigCommerce or through the domain registrar of your choice—but either way, that’s another cost to consider. As you do your business math, don’t forget to include the cost of a business license. Even if you have an online-only business, you’re still required to have a business license and employer identification number (EIN). So between the costly plans, expensive themes, paid apps, and domain cost, BigCommerce is one of the most expensive website builders we’ve tested. If you have a small boutique and don’t plan for growth, carefully consider BigCommerce’s high costs before signing up. But if you have a large-scale e-commerce operation, then BigCommerce’s retail features justify the price. After all, it’s one of the few website builders designed to handle large amounts of commerce. We’ve discussed most of what sets BigCommerce apart. But before you buy, let’s look at a couple other factors you should consider in any website builder. Don’t worry if you’re not an SEO pro—search engine optimization (SEO) just helps your website appear higher in search engine results when someone searches for content related to your site. While WordPress reigns supreme for SEO features, we did find that BigCommerce has some pretty capable SEO itself. It allows you to customize your page titles, meta descriptions (brief summaries of your page), and URLs. All of this makes it easy to include relevant keywords so search engines know what your website is all about. BigCommerce also allows for 301 redirects, which lets you redirect one URL to another without much effect on your search engine ranking. And it can generate XML sitemaps, which helps search engines find your pages (even as you update them) so they get included in results. So although BigCommerce doesn’t have the best SEO support we’ve seen, it definitely has enough for the average user. Before you actually contact customer support, you can look through BigCommerce’s extensive Knowledge Base. We found it very easy to navigate for information. It has everything from answers to common questions to tutorials on how to set up different parts of your website. Plus, BigCommerce has active customer forums where you can ask for help from the community. If you can’t find an answer through either of those resources, BigCommerce offers customer support through phone, email, and live chat. But rather than tell you our brief impressions of those, we’re going to turn to BigCommerce’s customers on this one. Their reviews have a lot to say about customer support. First, the good news: BigCommerce has an A+ rating with the Better Business Bureau (BBB). Now, the bad news: with 52 reviews on Trustpilot, BigCommerce has a 2.9 out of 10 Bad rating. When you look at the numbers, you’ll find almost the same amount of “excellent” ratings as you will “bad” ratings (19 vs. 20, respectively, once you take out non-customer reviews), which might suggest you’re about as likely to have a great experience with BigCommerce as a bad one. But—and this is a big “but”—only one of those “excellent” reviews is from the past year. The rest? From 2015 or 2014. In contrast, you’ll find 11 “bad” reviews from 2018 and 2019 (but only three from 2015). That breakdown suggests that BigCommerce’s customer reputation has grown worse over time. Whereas the vast majority of reviews used to be positive, now the vast majority are negative. So what happened? Well, it mostly comes down to customer service. Positive reviews from 2015 rave about BigCommerce’s support team, with several reviews noting how easy it is to get in touch with and get answers from customer support. But 2018 reviews all report that they found it difficult to get in touch with customer service and that support representatives were unhelpful. Some customers needed help with buggy features (like accepting discounts or even adding items to carts), and many needed help with billing (such as switching plans or getting billed after canceling). So while most reviewers seem to like BigCommerce’s software—including the website builder—they find its customer service so poor that several of them report switching to Shopify. What should you make of this? Unfortunately, Shopify doesn’t have great customer reviews either. And as you can see in our Shopify review, we didn’t like it as much as we did BigCommerce. If you need large-scale commerce, then we suggest sticking with BigCommerce, warts and all. Just prepare to carefully document your interactions with customer service. So now you know how BigCommerce rates and what it includes, but how exactly does the site builder work? We’ll walk you through our experience and what we found helpful and not so helpful. BigCommerce was built for e-commerce, so the basic website and the online store are pretty much one and the same (the site builder always refers to your website as “your store”). Out of the box, our theme consisted of a home page, contact page, and several product category pages. And unlike the home pages built by many other website builders, BigCommerce gave us a retail-focused home page. Our theme featured a carousel of images, all directing users to our store. This provides a great way to highlight new or popular products. And if that’s not enough, directly below our carousel was a “New Products” sections that automatically displayed our newest items. It looked good for a retail website. With good product photography, our website could easily fit in with the sites of popular national retailers. That being said, we tried to make a less retail-centric home page and struggled to do so. The carousel has limited options for displaying text, so we tried building a home page from scratch with BigCommerce’s WYSIWYG editor. The experience made us miss drag-and-drop builders. With this tactic, we never made a home page that looked presentable. Likewise, we struggled to create an about page. We had to use tables to create a layout that looked anything like the out-of-the-box pages we’d created with other builders, and it still looked pretty amateurish. Building non-retail pages with BigCommerce just feels—and looks—bad. As we’ve said, this problem can be solved by getting a paid theme. Several themes include templates for about pages or other pages, which could make it easier to create the website you envision. Of course, these themes will cost you—but we’ll cover that in our “BigCommerce pricing” section below. We created a simple online store with five products in it. We loved the way our store looked—not to mention how easy it felt to create. Simply add new products and the store builds itself. Each time we created a new product category, BigCommerce added the category to our top menu. This makes it easy for your customers to find what they’re looking for while minimizing the amount of work you have to do. Plus, you can add tons of details about each product. BigCommerce has fields for details ranging from product dimensions to weight to price to SKU to bin picking number. You can put in as much or as little detail as you like—whatever makes things easier on you. Some of these details are necessary for other integrations to work. Take shipping, for example. Optional apps like ShipperHQ will use details like product dimensions and weights to offer your customers instant shipping quotes. The app works with multiple carriers, like USPS and UPS. You can also connect to various payment processors, including big names like PayPal, Square, Apple Pay, and Stripe. Note that—unlike many e-commerce site builders—BigCommerce doesn’t charge you transaction fees on your sales, so you’ll only pay the usual transaction fee charged by your processor. But BigCommerce’s apps don’t stop there. You’ll find apps for things like taxes, live chat, and reward programs, all of which can improve the store experience for both you and your customers. You can even find apps for drop shipping, if that’s your business model. Between these apps and the attractive store layout, BigCommerce makes it easy to create a great shop. Our store looked professional, uniform, and modern—all important if you expect your customers to trust you with their money (not to mention their credit card information). BigCommerce preserved our line breaks, links, bolding, and headers. Aside from the ease of setup, the blog felt lackluster. While the blog layout that came with our (free) theme looked perfectly readable, it definitely looked amateurish compared to some of the blogs we created with other site builders. And there were some weird quirks that confused us. As an example, BigCommerce suggests you add a thumbnail image for each blog post, which then shows up on your main blog page. When we added our image, we were surprised to see the image also showed up—tiny thumbnail sized—on the post itself. We added a full-sized picture separately, and the thumbnail-sized image still appeared on our post. As you can see, it doesn’t look so good. So while you certainly can blog on BigCommerce, any serious bloggers will struggle with its limited blogging capabilities. If you’re determined to use BigCommerce and want a robust blog, we suggest hosting your blog elsewhere (maybe WordPress or one of the best web hosting providers). BigCommerce scored average or better for its ease of use, design, and customization. Its large-scale retail abilities make it stand out from most website builders, though sometimes we wish it had as many non-retail abilities. Ultimately, BigCommerce is built for just what the name says—lots of selling—and its features and pricing reflect that. If you’re selling a few hand-crafted cross-stitch portraits, BigCommerce probably isn’t worth the cost or the hassle. But if you need a website builder for your large-scale t-shirt operation, BigCommerce offers a powerful e-commerce solution that’s well worth the extra cost of its plans and themes.